The Shippuden invasion continues this fall in Naruto Shippuden: Legends: Akatsuki Rising, bringing team-based teen ninja battles to Sony's handheld. 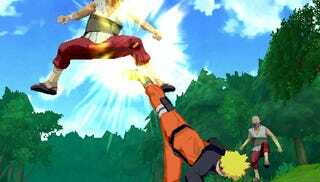 Players join a slightly older, slightly wiser Naruto and friends as they search for Gaara, who has been kidnapped by the dreaded Akatsuki organization. Will Naruto be able to free sand boy before the Akatsuki release the demon lurking inside of him? More than likely, unless you're a big fan of "Game Over" screens. The game is a 3D adventure title, with fighting that utilizes the timed button press method of replicating ninja powers. Players will be able to select two additional team members during the adventure, unleashing team attacks or utilizing other special powers as the situation requires. Akatsuki features two separate story modes, one of which allows you to play the main story from the Akatsuki point of view, along with local wireless versus mode and a scroll-collecting series of side missions. Have we seen the last of the older, younger Naruto? With the majority of Naruto titles coming out this year containing the word Shippuden, it certainly seems like it. Naruto Shippuden: Legends: Akatsuki Rising is due out in the fall from Namco Bandai.